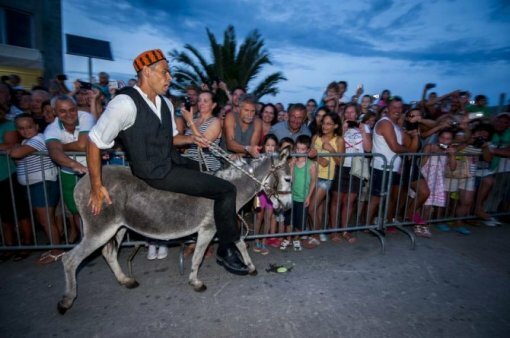 Recent donkey races held in Tribunj and Tisno are a reminder of Croatian low position on the list of EU countries in implementation of animal protection law and its enforcement. 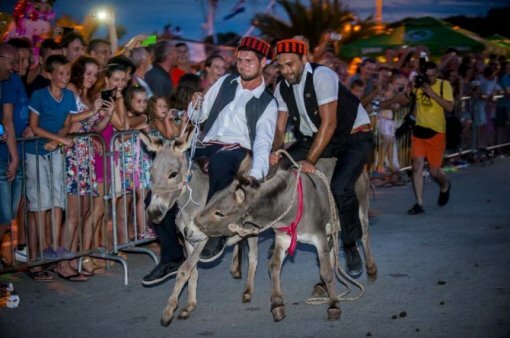 Donkey races, which are a typical summertime manifestation in coastal regions of Croatia, are a perfect proof of a shocking Croatian backwardness. The races are being present as a national fiesta or leisure time, and not as animal mistreatment which they actually are, just because of their portrayal as a tradition. The term "tradition" is being misused in Croatia as an excuse for other shameful violations of animal rights and their exploitation, for example bullfights. It is considered enough to pin the term "tradition" to any manifestation to justify horrific brutalities occurring on them. Those dreadful manifestations would be frowned upon even in Medieval times, let along in the 21st century. What some regard as fun and competition represents frustration, stress, pain and fear to involuntary participants to such events – the animals. It is important to be aware of the fact that, in most cases, people riding on donkeys have no knowledge of back-riding or any sensitivity for animals. That sad truth is perfectly captured on photographs taken on those races – you can see men with their feet scratching the floor because of their inadequate height while riding the donkey. That repulsive image can be compared to a race on which parents would ride on backs of their children. It is more than obvious that backs of animals are being overburdened with a "human load" bigger than them. In the same time, they are being forced to run with that burden on their backs. The backs of those innocent animals are often being deformed and excruciatingly painful because of exposure to heavy weight. The manifestation itself is terribly stressful for donkeys because of noisy cheerings and screaming of the crowd. To avoid any "accidents", animals are often deprived of water and food hours before the race. Some participants are also beating their donkeys to achieve a faster pace of the animal. 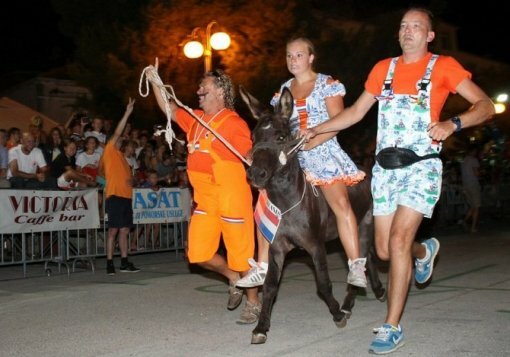 Besides the obvious molestation of animals in these races, exploitation of donkeys for amusement is sending a dangerous message to children and young people. The message is simple – it is acceptable to abuse and humiliate anyone weaker than you. The fact that these events are sponsored by touristic boards of the country is particularly worrying because it looks like Croatia believes animal molestation is an appealing form of tourist attraction. These "attractions" are also bullfighting, horse log pulling, donkey races, illegal and neglected zoos which should be closed, bow and arrow hunting, horses as living carousels etc. Grotesque photographs of riders sitting on donkeys' backs, outweighing the animal should cause feelings of shame, but instead they are regarded as national pride and a regular tourist attraction despite the fact that it is and obvious torture, which is making animals behave in an unnatural manner. That kind of animal treatment is making a mockery out of Croatia and it's animal protection laws, which are obviously not being implemented. Anyone supporting, organizing or financing these kind of events is directly supporting animal abuse, retrogression of Croatia and law breaking. Besides the obvious monstrosity of this kind of "fun", donkey races are directly breaking Animal welfare laws. According to the law, it is prohibited to use animals for competitions, especially if they will be forced to behave unaccordingly to their nature or if they will experience fear, pain, suffering or any injuries. Law also prohibits exposing animals to bad weather conditions or inadequate temperatures. Cities sponsoring or giving permission for such events, should be aware of the direct disobedience of the law. Is profit the only measuring tool of our tourism even though it represents loss of good reputation and money in the long run because of animal exploitation and law disobedience? Croatia has an enormous potential to develop interesting touristic programmes involving animals – why not let tourists visit donkey sanctuaries and take photos or walks with them in their natural environment? That would be a good way of promoting both natural beauties of Croatia and animal rights. 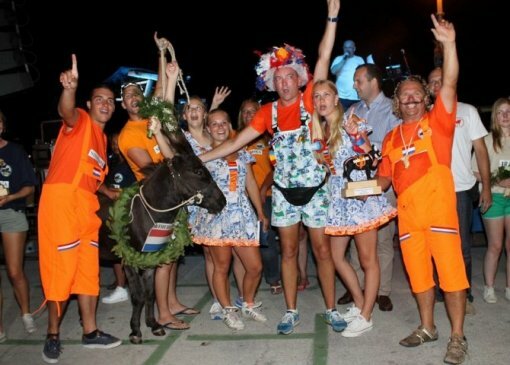 It should be stressed that donkey races are a failed touristic attraction because most of the foreign tourists come from countries where this kind of behavior would be considered barbaric and primitive, not fun and interesting. It is crucial to realize that Croatia must, as a tourism based country, develop a more ethical approach and also invest more energy to educate people about it's laws. We have to create a better offer to avoid a justified image of Croatia as a country of cruelty. Animals are sensitive creatures, they feel and suffer when they are abused or tortured, it is not hard to realize that in the 21st century thanks to scientific facts. Animals are not objects placed on Earth for humans to mistreat or use for fun. It is time for donkey races or similar events to become history. Croatia should turn to other contents with a focus on conservation of nature, and if it is not possible to focus on animal conservation too, then we should at least leave them be.